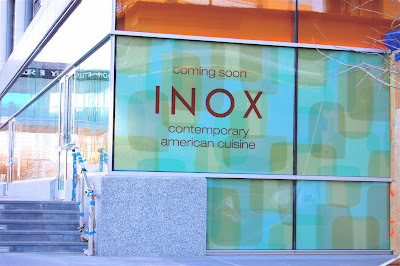 The cliché "too many cooks in the kitchen" couldn't help but spring to mind when I heard about Inox, a modern American restaurant slated to open the first week of February in Tysons Corner. To start, there are two head chefs/owners running the kitchen— Jon Mathieson and Jonathan Krinn. Add another chef (and a third John) in John Wabeck, who gave up his days behind the stove to be the restaurant's wine director. And tag on a fourth when you count Rissa Pagsibigan, a formally trained chef who will be Inox's general manager. But as Mathieson and Krinn explained during a recent tour, with a restaurant the size of Inox — 14,000 square feet — offering lunch, dinner and a sizable private dining room, it really makes sense. "We all excite each other," Krinn said. "The pieces fit together really well and hopefully the guests see that, too." Added Mathieson, "As chefs, we sort of gravitate to each other." Krinn and Mathieson worked together at 2941. Wabeck was previously executive chef at New Heights and Firefly and is awaiting the final test to achieve the prestigious Master Sommelier diploma. In a collaboration that goes beyond your average menu planning, the three have huddled over dish after dish, debating spice, acid and herbs in an effort to make the food extremely wine-friendly. Wabeck has compiled a regionally diverse list of around 650 labels that will complement dishes like pan-seared blue nose bass with pancetta, romanesco, escargot tortellini and brown butter emulsion; venison medallions with cinnamon-braised golden beets, pearl onions, chestnuts, venison ham and a red wine tamarind reduction; and crispy Maine lobster with potato gnocchi and black truffle emulsion. Entrées will range in price from about $27 to $33. Rounding out the bar offerings will be an all-American beer list and a menu of old-school cocktails. "I'm really traditional when it comes to that," Wabeck says. The name Inox comes from the French word for stainless steel. The restaurant is located at 1800 Tysons Blvd. in McLean, just down the street from the Ritz-Carlton. Hopefully they leave their egos at their old restaurant. There's no way 14,000 sq feet is enough to house all of them. Wow Anonymous, sounds like you think you know these guys? Funny thing is that most chefs in this area all have the same hate, cause they lack the skills that these guys have. Mike T......Not affraid to say who I am, unlike others!